This article is about Mario & Sonic at the Olympic Winter Games for the Wii. 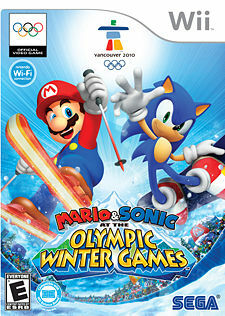 For the Nintendo DS version of the game, see Mario & Sonic at the Olympic Winter Games (Nintendo DS). Mario & Sonic at the Olympic Winter Games is a sports game for the Wii with a Nintendo DS version of the game released as well. Both games are a follow-up to Mario & Sonic at the Olympic Games. The game is produced under license from the International Olympic Committee in relation to the Olympic Winter Games taking place at Vancouver in 2010. Like the previous installment, this game is a collaboration between Sega and Nintendo featuring characters from both the Mario franchise and the Sonic the Hedgehog series. Although Sega was handling most of the development for both versions of this game, as it did for the original Mario & Sonic at the Olympic Games, they were also handling publishing/marketing duties for all territories outside of Japan, South Korea, Hong Kong, and Taiwan while Nintendo has done publishing/marketing duties for Japan, South Korea, Hong Kong, and Taiwan themselves. The Wii version employs the Wii Remote controls, as well as the Wii Balance Board. The game features a Festival mode where the player starts from the opening to the closing ceremony. In the Festival mode, the player can choose to play an individual festival, where the player faces off against 7 other CPU characters, or a team festival, where the player can choose three other teammates to play. New to the game is a marketplace that allows the player to purchase various items such as clothes and accessories for the player's Mii, tunes from both series, and customizable snowboards. Players can purchase these items using Star Tokens, which earn based on their performance. Also, the gallery for Olympic trivia has now been replaced with the Library. Also, all authentic (real-life based events) are unlocked from the start. Dream Events are in this game and all of them (excluding 2) need to be unlocked. The aforementioned Festival Mode, is a special adventure mode where the participants must compete with some boss characters from the Mario and Sonic series in various events. Both the DS and the Wii versions take place in a place known as Christmas Village. All the main participants on the Wii character selection screen, including the Mii. All of the characters from the previous game, including Miis for the Wii version, return. There are also four new characters who were not present in Mario & Sonic at the Olympic Games. Retaining the first game's style, all playable characters are unlocked from the start (including new participants). * A character who marks their first time playable in the series. It is possible to customize the outfit of the Miis in the game. Aside from differently colored suits, the Miis can also wear outfits that resemble the ones of the regular playable characters and a few bosses. For example, it is possible to give a Mii a Mario costume or an Amy costume. The player can buy equipment through the store in the game and unlike Mario & Sonic at the Olympic Games, the Miis' stats gets altered depending on the equipment they wear. There is a total of 16 different costumes for Miis based on characters from the Mario universe. Like the Mario universe, 16 characters from the Sonic the Hedgehog universe also appear as costumes for the Miis. When the player spots Birdo and Big the Cat, they will also be given costumes. When the game is played during the month of December, Santa Claus also appears as a VIP. Unlike other VIP characters, Santa gives 300 Star Points instead of 100. Mario Circuit (featured in Dream Ski Cross) from Mario Kart Wii. Bowser Castle (featured in Dream Ice Hockey) from Mario Kart: Super Circuit. Good Egg Galaxy (featured in Dream Ski Jump) from Super Mario Galaxy. Sherbet Land (featured in Dream Curling) from Mario Kart 64. In Dream Figure Skating, three backgrounds from New Super Mario Bros. appear: World 1, Bowser's Castle, and Peach's Castle. Dream Snowball Fight has the same music as in Cool, Cool Mountain and Snowman's Land from Super Mario 64. In Dream Figure Skating, three Sonic backgrounds appear: Green Hill Zone (from Sonic the Hedgehog), Death Egg Zone (from Sonic the Hedgehog 2) and the destroyed Station Square (from Sonic Adventure). Dream Gliding has the same music as in Sky Sanctuary Zone from Sonic & Knuckles. Wii James Newton, Nintendo Life 9/10 "Sega has truly listened to the feedback about the first game and slimmed down the waggle controls, beefed up the lastability with a ton of extra content and managed to turn even the seemingly dull events of Curling and Figure Skating into engaging and varied games. With over twenty characters, twenty-five events and hundreds of unlockable items, you’ll be playing this game well into the New Year, and the added subtlety of the controls makes playing it a far less tiring experience. It may not have the control genius of Wii Sports Resort but it’s every bit as good in terms of content, presentation and pure, distilled fun." Wii Jorge Ba-oh, Cubed3 7/10 "Mario and Sonic at the Winter Olympics is, at the end of the day, a huge party playing host to two most loved franchises and that's what it was designed for. It may be incredibly simple to work through the single player mode, but entertaining friends or family is where the package really shines through. Whilst it may be as accessible as Nintendo's Wii Sports, it may not be for everyone. The simplistic controls and gameplay might be a tad off-putting for those having a resume of gaming skills, but for the masses Winter Olympics are a solid package that can heat up a living room with fierce competition." Wii Ellie Gibson, Eurogamer 8/10 "It's true to say that Mario & Sonic at the Olympic Winter Games is no Mario Kart. But it's a fun, polished party game with broad appeal, and a marked improvement over the previous one. Let's just hope the next instalment has a bit more depth. And is called Mario & Sonic of War, obviously." For this subject's image gallery, see Gallery:Mario & Sonic at the Olympic Winter Games. Super Mario Bros. - A remix of the overworld theme and castle theme of this game is available as one of selectable songs in this game. Super Mario Bros. 2 - Peach's floating ability returns as her special skill in this game. Super Mario Bros. 3 - A remix of the athletic theme of this game appears as one of the selectable songs in this game. Super Mario World - A remix of the athletic and the ending themes appear as one of the selectable songs in this game. Super Mario 64 - The Cool, Cool Mountain and Snowman's Land music tracks are remixed for the Dream Snowball Fight event. A remix of the main theme and the Bowser's stage theme is used. Mario Kart 64 - The Dream Curling event takes place in Sherbet Land from this game. Super Smash Bros. Melee - Luigi's special skill, Luigi Rocket, is similar to the Green Missile. Bowser's special skill, Spinning Shell, is similar to Whirling Fortress. Super Mario Sunshine - A remix of Delfino Plaza's music appears as one of the selectable songs in this game. Mario Kart: Super Circuit - The Dream Ice Hockey event takes place in Bowser Castle from this game. New Super Mario Bros. - The athletic theme appears as one of the selectable music tracks. Three backgrounds from this game appear in the Dream Figure Skating event, namely World 1, Bowser's Castle, and Peach's Castle. Super Mario Galaxy - The Dream Ski Jump event takes place in the Good Egg Galaxy. Purple Coins can be collected in most of the Dream Events. The Purple Comet theme along with the Gusty Garden Galaxy's theme, under the title "Wind Garden," appear as selectable songs in this game. Mario Kart Wii - The Dream Ski Cross event takes place in Mario Circuit from this game. The Coconut Mall theme appears as one of the selectable music tracks. The Mega Mushroom and POW Block, two of the three new items introduced to the Mario Kart series in this game, appear in at least one Dream Event. Mario Sports Mix - The gameplay in Hockey in this game is similar to Ice Hockey from this game. Mario & Sonic at the London 2012 Olympic Games - Most of the Mario and Sonic series music return as well as the Mii costumes. The story mode in this game is referenced by Toad, Magikoopa, and Silver. Bowser's profile artwork is the same as his artwork for New Super Mario Bros. Wii, which came almost a month after this game. An app based on this game was released for Apple's iPhone and iPod Touch, but only features Sonic characters and thus is named simply Sonic at the Olympic Winter Games. This game has since been removed from the AppStore. This is currently only game in the series to be released on both consoles on the same day (except Japan and South Korea). This page was last edited on April 8, 2019, at 14:49.